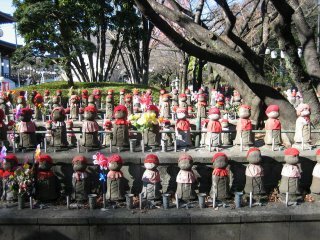 on the way to tokyo tower, i walked pass a shrine where in its garden lie a shrine for the unborn child - aborted or miscarriaged. but what amazed me looking through these carved children was some were still being taking care of - meaning their parents still visit them with flowers and toys like burials. they are after all a burial. i never know there's this kind of shrine.